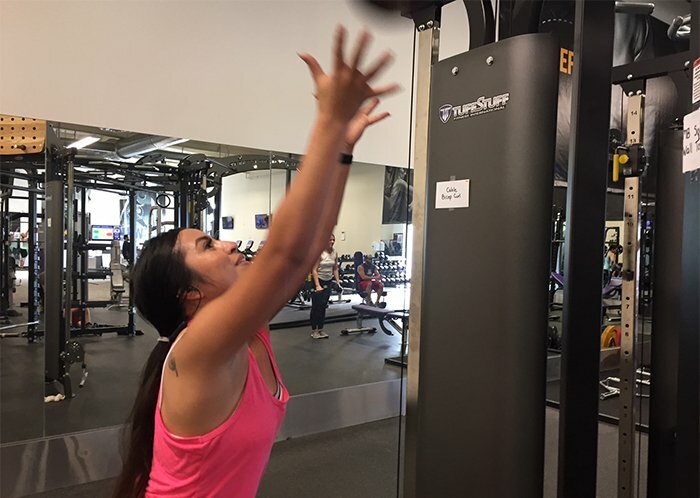 Brenda Garcia, a GCU enrollment employee, loves the new equipment at the center. She was tossing a weighted ball against the new octagon. The octagon, an eight-sided multi-purpose fitness machine that allows numerous people to exercise at once, is one of the new additions at the newly renovated 27th Avenue Fitness Center. Her attention was at once drawn to a new piece of equipment, the eight-sided TuffStuff Fitness International Octagon, which allows numerous people to work out at the same time. The fancy machine, which arrived Friday, is one of the extra options at the updated fitness center. Pono Construction renovated the workout facility over the holiday break. 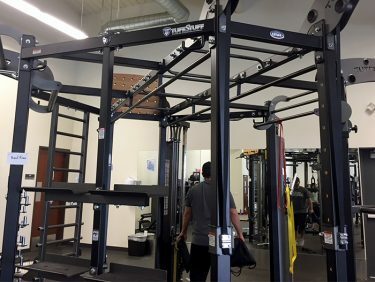 The renovation more than doubled the size of the men’s and women’s locker rooms and added space to the fitness center, said Butch Glispie, owner of Pono Construction, the company at the heart of GCU’s explosive physical growth. 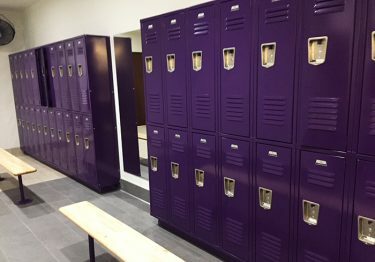 Elise Williams, GCU Office of Financial Aid default manager, said that she particularly appreciates the expanded, spiffed-up women’s lockers. Williams said she also enjoys the new octagon. One of its options — hurling a weighted ball against one of the eight sides — makes her feel like a little kid. “It makes me feel energized, playful,” Williams said. 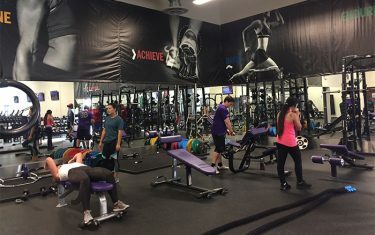 The 27th Avenue Fitness Center is not just a workout place, it’s a community-building environment, said Chuck Howard, GCU Corporate Wellness Administrator. The renovated facility isn’t all that’s new. On Jan. 1, GCU launched “Wellness 360,” a multipronged program intended to offer options for leading healthier lifestyles. The company-wide New Year Solutions Challenge kicks off this week and ends Feb 11. Participants log into an online Wellable account and earn points and prizes by tracking exercise, nutrition and participation in themed activities. Employees gave high marks to the roomy, renovated locker rooms at the 27th Avenue Fitness Center. begins 11 a.m. Wednesday in Building 71. Those who meet goals and attend 11 of 12 sessions can earn an $80 gift certificate to offset the $156 cost. For questions or enrollment information, contact Howard. Another way to earn points is to weigh in from noon-3 p.m. Wednesday and Thursday on the main campus at Chaparral Hall, Building 45, Room 104. A second option is to weigh in from 5:30 a.m.-9 p.m. Tuesday-Friday at the 27th Avenue Fitness Center. Additionally, Tim Promberger, Chef du Cuisine at Canyon 49 Grill, plans to conduct monthly healthy-cooking classes in Building 71’s Canyon Cantina. The classes are set for the first Thursday of every month except the first one, scheduled for Feb. 8. I have not used the new renovated facility yet but I have heard great things about it. I know a lot of employees are talking about how nice it would be to have a lap pool, sauna and a huge spa (hot tub) added to another future renovated expansion. It would also be nice for the facility to be available 24 hrs for those of us who work swing shifts and nights.